You still don’t own a GPS ? Tsk, Tsk. You don’t know what you’re missing. Yes, my 70 year old mom has one, and she uses it. You should too. My refurbished TomTom arrived from Buy.com today with the GPS, the windshield suction cup, the 12V cigarette adapter, and everything wrapped up, like new, in a shiny retail box. The exact GPS model you choose today will work differently than the exact same model from months ago because of changes in components and software. So, don’t expect that a 2 year old review you read will be valid for the same GPS model you buy today. Our family car has a Garmin c320 which is now a couple years old. My mother has a TomTom One. I just purchased another TomTom One for a second vehicle for $99. Sure, the two recently purchased TomToms have much better reception than our Garmin c320 because they have more advanced electronics. The newer TomToms consistently receive more satellites more quickly and more strongly than our Garmin c320. 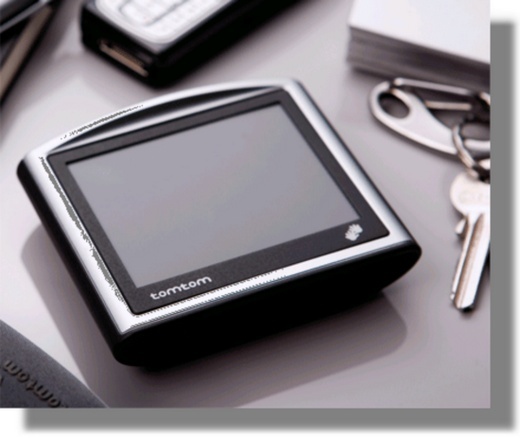 Our Garmin was $350, the TomTom is now $99. Does this mean that Tom Tom always has better reception than Garmin? No. It depends on the model and the date the GPS was manufactured. Also, Our two TomToms Ones (both the same model) have slightly different software menus and options. I could probably upgrade both TomToms so they have the same software, but they’re both working well for now, so I likely won’t mess with what is already working well. If you have the means, and want to have the “best thing” for a finite about of time, you can get GPS units that display live traffic, give weather reports, play music, dial your cell calls, and so on. All GPS models essentially do the job of getting you from one point to another. I don’t really drive in traffic much so I don’t miss the live traffic capability. The TomTom doesn’t pronounce the street names but some other more expensive GPS units do. To be clear, the TomTom One will give voice directions such as “Turn left in 500 feet” instead of saying “turn left on Maple Avenue.” I don’t consider speaking the screen names to be a critical feature and don’t miss it. At $99 I just wanted something I could throw in the glovebox of our second car so that if I was driving and wanted to find a specific restaurant or coffee brand, my GPS would let me do it in an instant. In my opinion, owning a cheap GPS is better than having no GPS at all. Next How can I Wipe My Hard Drive clean before I give my Computer Away?